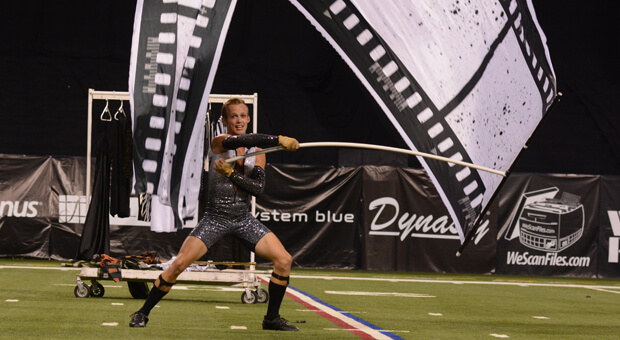 Blue Devils lit up Lucas Oil Stadium on Friday and continued to impress the judges with their 2014 program "Fellniesque," capturing yet another first-place finish with a score of 98.950 and sweeping the overall captions. 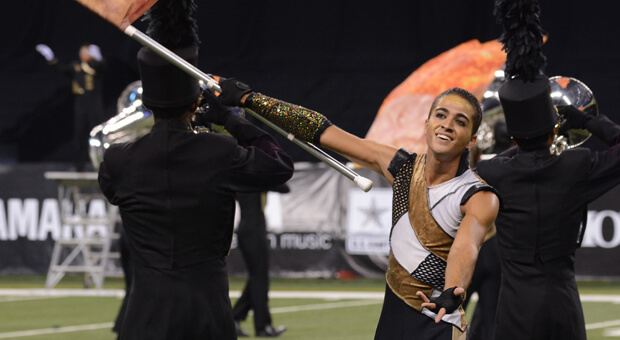 The record high score at the World Championship Finals was set at 99.150 by the Cavaliers in 2002 and was tied in 2005 by the Cadets. Many are already speculating if we may just be looking at a new record holder if the Devils can find it in them to jump two tenths of a point overnight. "We've been rehearsing hard every day, and we're becoming more and more cohesive as an ensemble," said front ensemble member Gabe Monteyor. "It would be really exciting to set a new standard for the activity." The Cadets are going into the Finals in second place (96.700) while the Bluecoats (3rd, 96.550) are sitting just fifteen hundredths of a point behind the Allentown corps. This marks the closest the race has been between the two competitors all season. 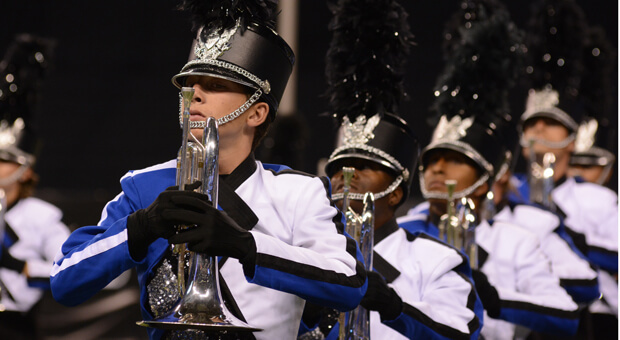 The Bluecoats were second in overall general effect and tied the Cadets for second place in overall music. Santa Clara Vanguard (4th, 95.650) once again had the top percussion score of the evening with a 19.5, and although the Bluecoats are nipping at their heels, Vanguard's percussion arranger and caption head Paul Rennick has faith in the members to pull off one more high score tomorrow. "One of the hardest things to do is to hit that three times in a row," said Rennick. "But I think we've reached such a consistent level of performance that we're just building on our own confidence." Carolina Crown took home fifth place with a score of 95.300, the Cavaliers received sixth with a score of 93.275, and the Blue Knights followed in seventh with a 91.825. Phantom Regiment members (8th, 91.550) came into tonight's competition feeling comfortable and confident after their Prelims performance and delivered their best performance of the season according to brass caption head Christian Carichner. "I think this show has so much incredible depth and beauty to it, and the amount of expression that's developed over the season is absolutely remarkable," said Carichner. "I'm looking forward to watching them take over the show. At this point, it really does completely become theirs. It's out of everybody else's hands." Even though the gap in score decreased, Blue Stars (9th, 89.225) kept hold of their lead on Boston Crusaders (10th, 89.050), and the Madison Scouts took 11th with a score of 87.650. The Crossmen (12th, 85.450) from San Antonio snuck into the "Top 12" after missing out last year with a 14th-place finish. This is only the second time in the last 10 years that the corps has advanced through the Semifinals, and for drum major Jordan Schock, it's a dream come true. "Icing on the cake," said Schock. "It's my fifth year with the corps and I'll be sad to see it go, but it's been nothing short of spectacular. I've grown a lot and had the best time of my life." The Texas corps received a one-point penalty Friday night that according to contest director Tony DiCarlo was assessed to the corps for a warm-up violation. The deduction put the Colts (13th, 85.350) within a tenth of a point of securing a spot in the Finals competition for the first time since 2007. The Troopers (14th, 84.775) kept their distance from Open Class Champions Blue Devils B (15th, 82.325), but overnight the California corps surged past three World Class ensembles including the Academy (16th, 81.875), Spirit of Atlanta (17th, 81.550), and Oregon Crusaders (19th, 80.100). Vanguard Cadets (18th, 80.200) also made an impressive jump ahead of its World Class competition, placing ahead of the Oregon Crusaders and Pacific Crest (20th, 78.900). Mandarins members performed their program "Unbreakable: The Human Spirit is Limitless," and finished 21st with a score of 78.150. 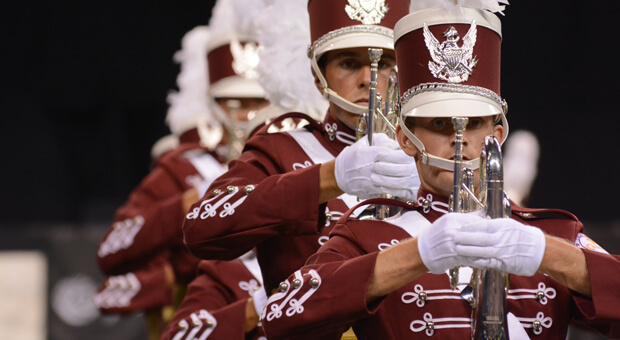 Drum major Barrett Juhrend believes that the show title is a fitting tribute to the corps' 2014 campaign. "In drum corps, you have to have an unbreakable spirit to push through the season and survive the days that you may not have much going your way," said Juhrend. "You may ache and you may be sore, but at the very end you've accomplished so much." Jersey Surf (22nd, 75.80), Genesis (23rd, 74.075), Spartans (24th, 74.050), and 7th Regiment (25th, 71.475) rounded out the Semifinals competition and brought their summer seasons to an end. 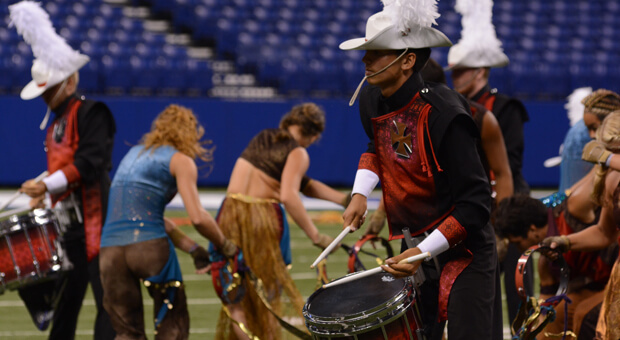 On Saturday, the 12 highest scoring corps will meet at Lucas Oil Stadium to perform one last time as the 2014 Drum Corps International Tour comes to a close.